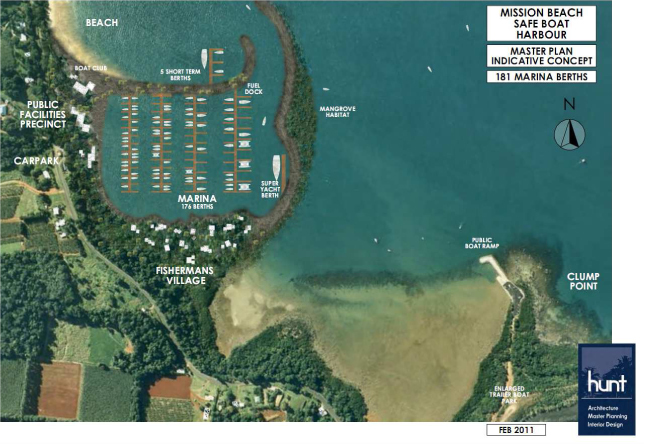 A new concept for a “safe” marina has been drawn up to accommodate, 176 berths, 5 short term berths, super yacht berth, fishermans village, public facilities precinct, car park and even some mangrove habitat. Cyclone Yasi is being used by would-be marina developers to take advantage of the post-YASI reconstruction effort. They are lobbying Federal and State Politicians and government department officials to cut through red tape and fast-track approval for a marina at Boat Bay. Above is how the high ecological area of Clump point/Narragon Beach is envisaged to look after excavation, reclamation and installation of rock walls. The debate is now open on 'needs' vs 'wants' and just where the community and natural environment stand when considered alongside short term economic gain.